Kristin LaFollette received her BA and MA in English and creative writing from Indiana University. She is a PhD student at Bowling Green State University studying English, rhetoric and writing, and women’s, gender, and sexuality studies. Her poems have been featured in West Trade Review, Poetry Quarterly, Lost Coast Review, Slipstream Press, The Light Ekphrastic, The Main Street Rag, and River Poets Journal, among others. She also has artwork featured in Harbinger Asylum, Plath Profiles: An Interdisciplinary Journal for Sylvia Plath Studies, and Pretty Owl Poetry. She lives with her husband in northwestern Ohio. You can visit her here. Linsey Jayne: I’d love to take this opportunity to tell our readers a little bit more about who you are. From your bio, I learned you’re a PhD student specializing in rhetoric and writing and women’s, gender, and sexuality studies, and you have a background in creative writing. Do your studies or your creative writing background have any influence on your art? Kristin LaFollette: I’ve always been interested in creating/studying art, but my interest in collage art started during my undergraduate studies at Indiana University. Dr. Kelcey Parker Ervick taught a class on “narrative collage,” a hybrid genre that combines elements of image and text that has its beginnings in the Dadaist and Surrealist movements of the 1910s and 1920s. I was so interested in this genre that, when I began my graduate studies in creative writing at the same institution, I worked with Dr. Ervick on a full-length narrative collage as my thesis project for the program. As a PhD student now, I continue to work on poetry, narrative collage, and art, and have become particularly interested in embodiment and portraying the body, which probably stems from my interest in women’s, gender, and sexuality studies and also my past as a pre-med student during the first three years of my undergraduate studies. I love finding ways to combine my passions for poetry/written text and art in collages and works of narrative collage. Linsey Jayne: What is your preferred medium? What do you love most about it, and what about it speaks to you? 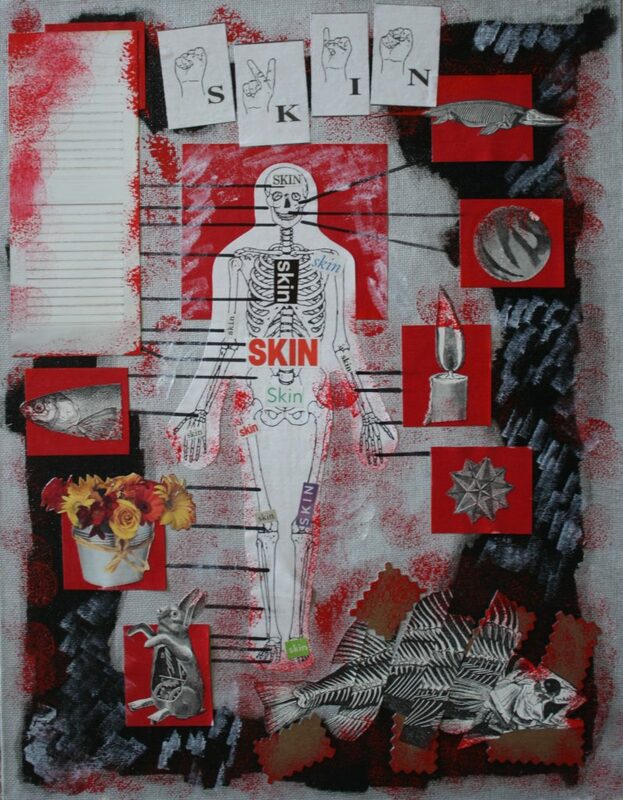 Kristin LaFollette: What I love about collage art is that I can work with any material or medium. I enjoy going to art shops and picking up various materials, but I also equally enjoy incorporating found materials (scraps, newspaper clippings, images from old books, etc.) into my artwork, true to the way many Dadaist and Surrealist works of art came to be. Linsey Jayne: What is the process of creating art like for you? How do you know when a piece is complete? Kristin LaFollette: I like the “rawness” of a piece that comes together organically. My philosophy with poetry is to revise as little as possible while still producing a beautiful piece of art, and I think this comes through in my artwork, as well. Knowing a piece is finished is almost a sense that I can’t describe – it’s finished when I can’t add to it or revise it without hindering the “rawness” of the overall piece. Linsey Jayne: Can you describe your creative space? Kristin LaFollette: This may be a unique statement for a creative person, but I work well in a clean, organized environment. I have a space in my home with a desk where I keep all of my materials, so they are close by and accessible. However, as a collage artist, I’m also looking for new (found) materials, so my creative space often extends beyond my desk. Linsey Jayne: How has your artwork evolved over time? What have been the most challenging obstacles to overcome in your work as an artist? Kristin LaFollette: I used to paint and sketch and shoot photos separately, but now I try to create combinations of these mediums in my collage art. I’m very passionate about photography, so I love being able to pair my photographs with found materials and interesting colors and textures. The narrative collage class I took as an undergraduate really helped me to see that not all artwork falls under strict categories like a painting or a photograph, but that a piece of art can be a hybrid of multiple materials and modalities. Linsey Jayne: What inspires an idea for you? How do you take an idea from inception to creation? Kristin LaFollette: As a collage artist, I often get inspired by a found item (like an image or a clipping from a magazine). Other times, I’ll write a poem and envision what images might accompany the poem. I appreciate narrative collage because it combines both image and text, so I can pair a poem I wrote with a photograph I took and utilize several of my passions in one piece. Linsey Jayne: As you know, in writing, we do a lot of drafting until a piece is complete — trying out forms, scrapping, repeating. What is the “drafting” process like for you as an artist? Kristin LaFollette: As I mentioned earlier, I try not to revise a poem or a work of art so that it loses the “rawness” it had when it was first created. The revision process for a work of art is much different than for a poem, and I see “drafting” as a learning process when I’m creating my artwork. If I try something and it doesn’t work out the way I wanted it to, I’ve learned something for the next time I create a new piece. I try not to see “mistakes,” but rather opportunities to learn and grow as an artist, and sometimes a mistake can turn into a beautiful addition to a work of art. Linsey Jayne: Are you working on any projects currently that you’d like to share with our readers? Kristin LaFollette: I’m a second-year PhD student, so I’m currently working on developing my dissertation topic, and I’m planning to focus on an aspect of narrative collage in my dissertation. While my PhD work takes up most of my time, I’m always writing and I have poetry forthcoming from Bridge Eight Literary Magazine and Cordite Poetry Review. This past summer, I had poems featured in issues of Burningword Literary Journal and Ascent Aspirations Magazine. Linsey Jayne: If you could turn the world onto one artist, whom would it be, and why? Kristin LaFollette: This past June, I went to the Cleveland Museum of Art with some classmates from my program. I got to see Max Ernst’s Le Déjeuner sur l’Herbre firsthand, and I fell even more in love with Ernst as an artist. As an undergraduate student and a graduate student, I studied Ernst’s French collage novels Une Semaine de Bonté (A Week of Kindness) and La Femme 100 Têtes (The Hundred Headless Woman), so it was a surreal experience seeing his artwork in person. I appreciate the tensions Ernst creates between image and text and how he presents his subject matter in new and wonderfully chaotic ways. Linsey Jayne: What’s the name of your favorite book, author, or poet, and why is this book (or person) so close to your heart? Kristin LaFollette: It may seem cliché for a poet to say this, but I absolutely adore Sylvia Plath. A few years ago, I picked up an old copy of Letters Home: Correspondence 1950-1963, a book compiled by Plath’s mother of letters she wrote during her time as a student and a writer. Plath, even amidst her tumultuous personal life and battle with mental illness, wrote beautifully and she has inspired me to always keep writing and to never afraid to be vulnerable in my poetry or artwork. In one of her letters, Plath wrote, “I write only because / there is a voice within me / that will not be still.” I never want to run out of things to share with the world. I always want to keep creating. Linsey Jayne: Is there anything else you’d like to share with our readers? Linsey Jayne is a wave-headed poet with a penchant for jazz who received her MFA in creative writing at Fairfield University. Her writing has been published in such publications as The Standard-Times, The Dartmouth-Westport Chronicle, and exactly.what. She has served as the chief poetry editor for Mason’s Road, as well as the student editor for the Bryant Literary Review and the opinion section editor of The Archway. Linsey is currently at work on her first collection of poetry, entitled Idle Jive.